The St. John New Brunswick native who called Yarmouth Nova Scotia home began his military career in the militia, as a member of the Royal Canadian Corps of Signals. In June of 1940 he enlisted in the RCAF in Montreal. Completing training at No.1 Manning Depot , Toronto followed by posting to No. 1 ITS with move training at No.4 ITS. His Service Flying Training School was No. 31 at Moose Jaw Saskatchewan, flying Oxfords and after graduation remained On Strength at the SFTS until January of 1941. He was attached to the Western Command for a period of time, serving with No. 120 BR squadron at Cold Harbour B.C. he moved Eastward again to Yarmouth and then to No. 161 BR (Bomber Reconnaissance) finaly serving at the "Y" Depot up until January 20th of 1944. F/O Black completed his two ops as 2nd. Dickie on August 26th and on Sept 14th. With the rank of Flight Lieutenant began operational missions. On the night of October 6th his Lancaster completed the 1,000 sortie made by Canadian made Lancasters. During this operation F/O Griffiths flew the squadron's 3,000th sortie. One of the completely odd attacks carried out on one of 419's Lancasters occured on the night of December 15th while near Ludwigshaven. F/L Black flying VR-J, his F/E, Sgt. Pollard sighted a a Fortress (B-17) on the port bow and slightly above him. Unusual because this was around three in the morning and the USAAF normally flew daylight raids not night raids. Black asked his mid-upper gunner to swing his guns around on to the B-17 as Black mentioned years later he told the gunner that "I've got a funny feeling about this". Then pulling up the Lanc's nose possibly to avoid the slipstream from the American made four engine bomber. At that exact moment the Fortress opened fire on the Lancaster from it's starboard waist gun and tail guns, then it dove off to starboard corkscrewing down. With this sudden and most likely shocking attack , Black climbed steeply to port to put distance between his Lancaster and the Flying Fortress. The attack wounded Bomb Aimer McKinnon in the foot while he was in the nose of VR-J. The crew and aircraft were still not out of danger, as they passed over the towns of Hochspeyer and Elmstein an unnoted flak battery opened up and and made hits on VR-J. This was another unexpected attack, no flak had previously been reported in this area. S/L Black landed the Lancaster at Woodbridge where McKinnon was admitted to Ipswich and East Suffolk Hospital where he remained for six days listed as seriously wounded. My bomb aimer, McKinnon, had done his job and always sat on the bench with the navigator who was seated just behind me. He stood up to stretch his legs and asked if he could look out the cockpit window to see this B17. After a while, we finally decided that had to be one of ours that really got screwed up so we figured that they might want to follow me home in case their instruments were out, so I gave them the benefit of the doubt. As the old Lancaster is faster than a Fortress, I figured I would just decrease speed a little bit to give him a break. As I slowed down, the B17 increased speed and went up 75 yards ahead of me then suddenly dipped down and went under my nose and opened fire from its rear gun. 2 Flight Lieutenant Black immediately climbed hard to port as the tracers came up but was unable to avoid some of the 0.50 calibre bullets that slammed into the Lancaster's nose, one shell injuring one of the Lancaster crew! Bomb aimer McKinnon didn't say a word or yell he had been hit. My navigator said Mac had been hit and was down. In the meantime, the B17 had vanished. We had to get to an emergency hospital because Mac's foot was almost shot off and he might bleed to death. We carried these big shock things [crash pads] in the aircraft you could pull down off the wall. 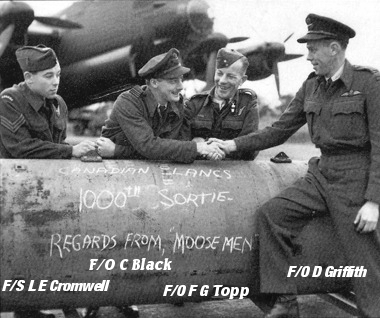 On January 29th 1945 after completing 18 operations with 419, S/L Black and his crew were posted to 426 squadron. The crew was listed on the ORB sheets as "poste Out" but the name Black does not show. It may have been because of his rank or some over sight. While with 426 squadron W/C Black received his DFC. Our thanks to author/researcher Ken Wright for allowing us to use his research on W/C Black and the incident with Fortress. By sharing his research he has helped all of us know more about the 419 Moose Squadron.